58 parish churches have stood within the medieval city walls of Norwich. 27 of these buildings have been lost, many in the religious turmoil of the mid-16th century or during the air raids of World War II. Despite such dangers, 31 have survived and Norwich boasts the greatest concentration of medieval urban churches north of the Alps. Not only are these medieval churches significant for their architectural quality and the medieval furnishings and objects held within, but also for their inextricable relationship with the physical, social, and cultural character of the city. Each church location is full of potential information – the siting of churches and churchyards relates to rivers and watercourses which in turn helped to define the parishes of the city, they take account of landscape features such as the hills and valleys of the medieval city, and they are frequently associated with early developments such as roads and adjacent buildings. The churches and their surrounding churchyards have not only defined the topographic structure and urban character of Norwich but, with close study, can reveal chronological relationships, urban expansion and occasional urban contraction. 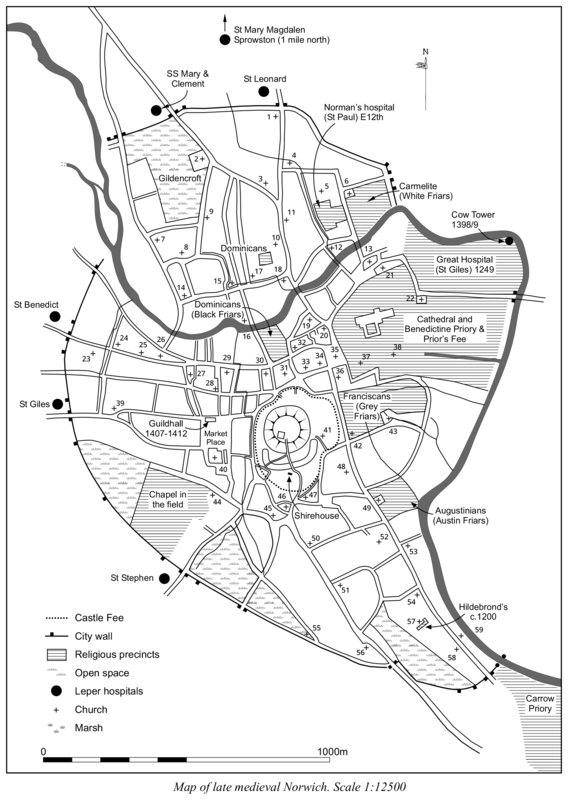 This map of the medieval city shows the location of each parish church in Norwich. The surviving churches are all Grade I listed, recognition of their significance as a group as well as individually. The churches contribute more detail and identity to the Norwich cityscape than any other building type. No medieval parishioner lived in isolation from the residents of other parishes, and the closeness of the churches to each other inevitably led to keen competition and emulation. Rather than resulting in many instances of one church, these circumstances produced a remarkable variety of forms, architectural and decorative details. All Saints Westlegate (45), Andrew (30), Augustine (2), Clement Colegate (18), Edmund (12), Etheldreda (54), George Colegate (15), George Tombland (20), Giles (39), Gregory (27), Helen (within Great Hospital) (not numbered), James (6), John the Baptist Maddermarket (28), John and the Holy Sepulchre (56), John the Baptist Timberhill (46), Julian (52), Laurence (26), Margaret Westwick (25), Martin at Oak (7), Martin at Palace (13), Mary Coslany (8), Mary the Less (34), Michael Coslany (14), Michael at Plea (33), Peter Hungate (32), Peter Mancroft (40), Peter Parmentergate (48), Saviour (11), Simon and Jude (19), Swithin (24), Stephen (44). Holy Trinity/Christ Church (taken over by cathedral priory, 1096) (not numbered), Christopher (probably burnt in the reign of Henry III) (31), Clement Conesford (amalgamated with Julian in 1482) (53), Cuthbert (demolished c.1530) (36), Ethelbert (burned 1272) (37), Helen (first church demolished c.1247, relocated into the Great Hospital) (22), John the Baptist (taken over in 1226 by the Dominican friars) (17), John the Evangelist (demolished c.1300) (42), Margaret in Combusto (amalgamated with All Saints Fybriggate c.1437) (1), Margaret Newbrigge (abandoned after 1368) (16), Mathew (amalgamated with Martin at Palace c. 1377) (21), Michael Conesford (amalgamated with Peter Parmentergate in the late 14th century) (49), Winwaloy/Catherine (55). In addition, three churches of uncertain status were lost in the medieval period: Michael Tombland (probably demolished c. 1096, Blomefield states it was a palace chapel) (35), Olaf Conesford (demolished before 1345, probably not parochial) (59), unknown dedication (excavated at Anglia TV site, date of loss and status uncertain) (41). All Saints Fybriggate (sold and pulled down 1550) (4), Botolph (3), Holy Cross (churchyard leased 1549) (29), Edward (57), Martin in Balliva (47), Mary Unbrent (10), Mary in the Marsh (38), Olaf Pitt Street (demolished 1546) (9), Vedast (43). Bartholomew (ruins of tower survive) (51), Benedict (ruins of tower survive) (23), Michael at Thorn (bombed 1942: demolished) (50), Paul (bombed 1942: demolished) (5), Peter Southgate (ruined) (58).